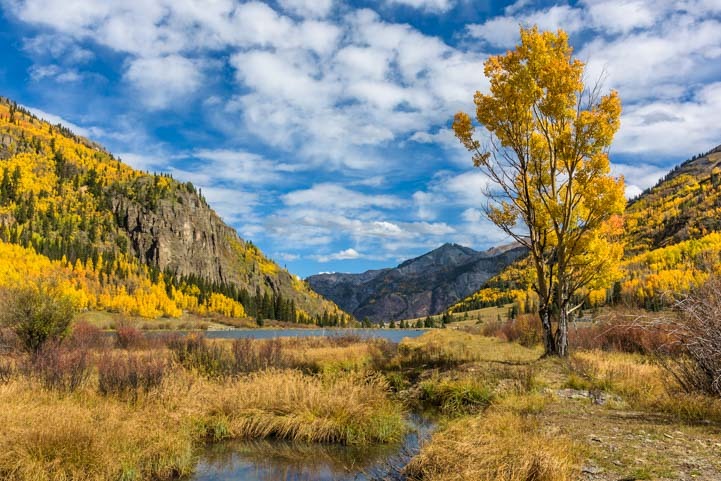 September 2016 – Chasing the late September fall foliage season in Colorado’s San Juan Mountains high up at a lofty altitude of 10,000 feet brings hillsides filled with shimmering golden aspen leaves. 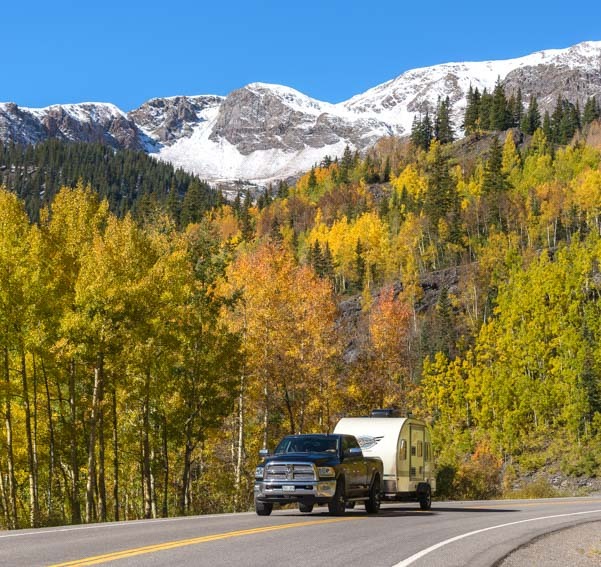 What a beautiful place for an RV road trip – The San Juan Mountains in late September! 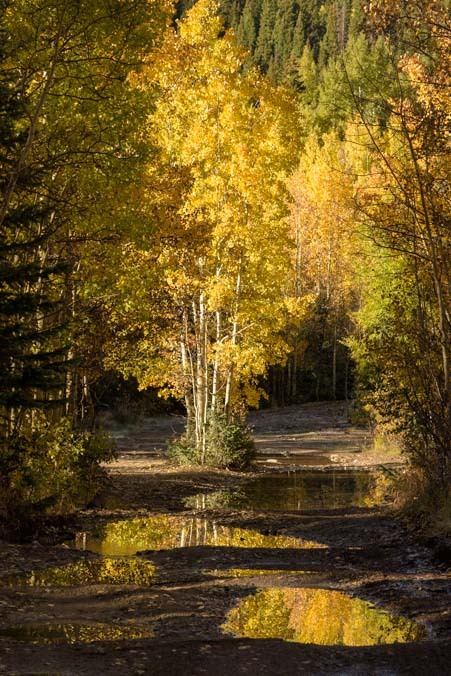 The fall foliage season in Colorado is spectacular when the sun is shining and the air is warm. But a layer of pure white snow makes it ever so much more dramatic. 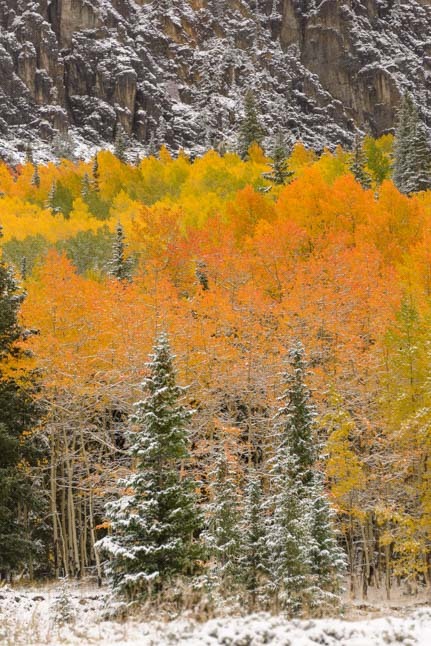 Fall color in the snow… beautiful! The temps in the mountains were bitterly cold, dropping into the twenties at night. 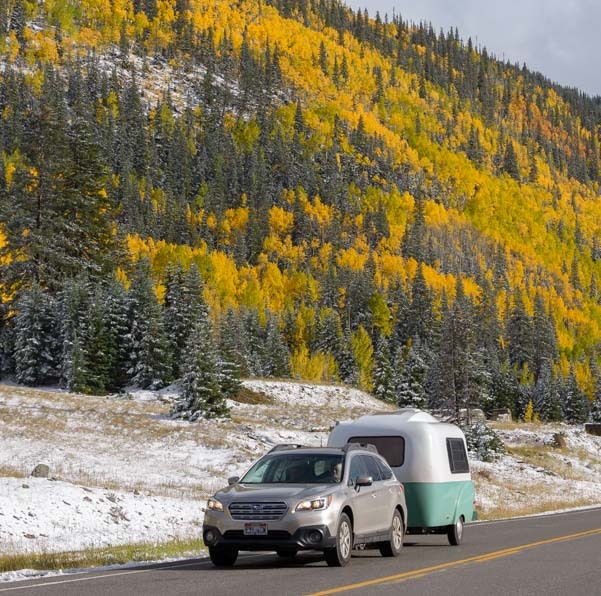 This prompted us to run our furnace as well as our vent-free propane heater and put together a blog post about how to heat an RV in cold weather! But it was oh-so-beautiful. 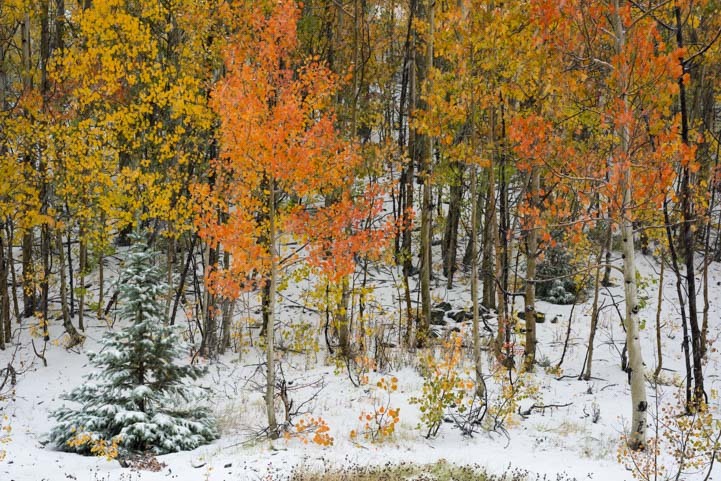 The juxtaposition of spiky evergreens, trimmed in white snow, against a backdrop of vivid orange and yellow was sensational. The scenery in every direction was magnificent. 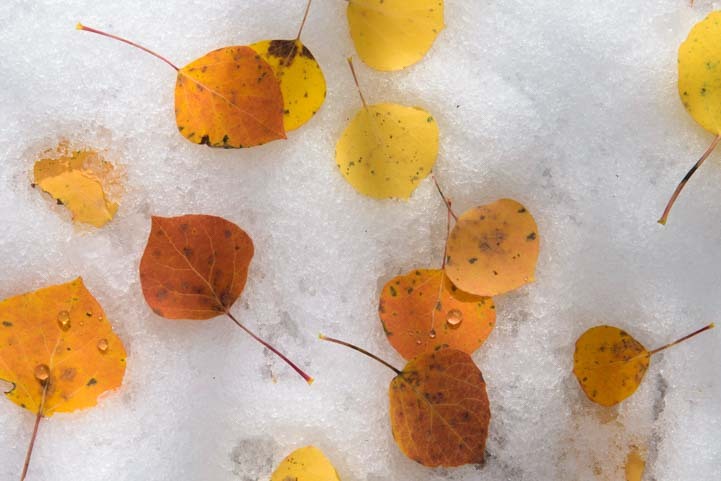 Up close, each aspen branch held a little layer of snow. 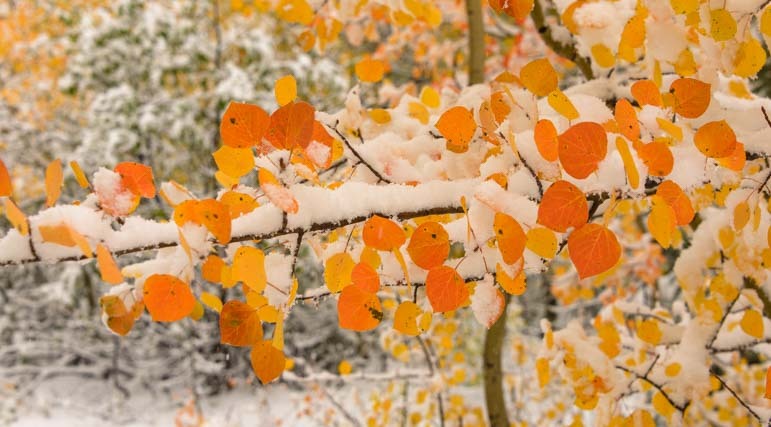 After the snow stopped falling, the wind blew, and the yellow and orange aspen leaves fluttered to the ground and settled on the snow. 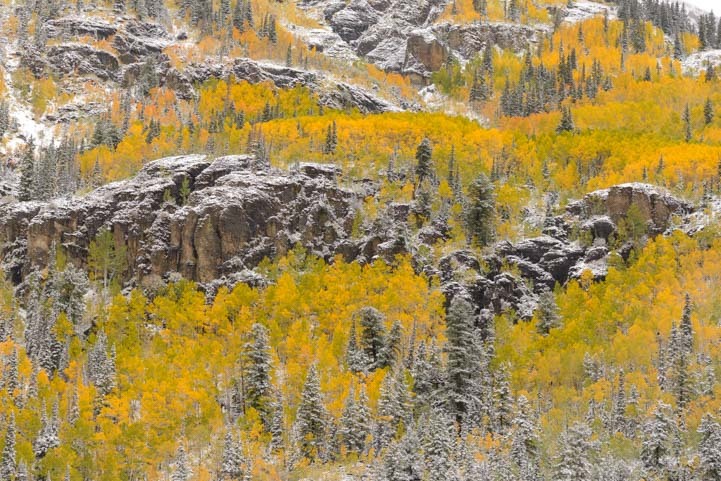 The craggy rocks on the mountainsides were covered with a lovely dusting of white lace. 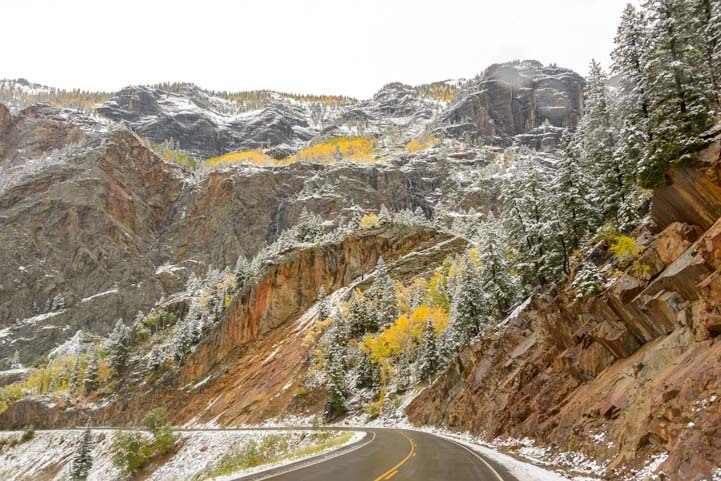 Out on the Million Dollar Highway, a portion of the San Juan Skyway that goes from Durango to Silverton to Ouray, the views from the passenger seat were awe-inspiring. As the roads dried and people got back on the move in their cars again, we saw a few small trailers go by. 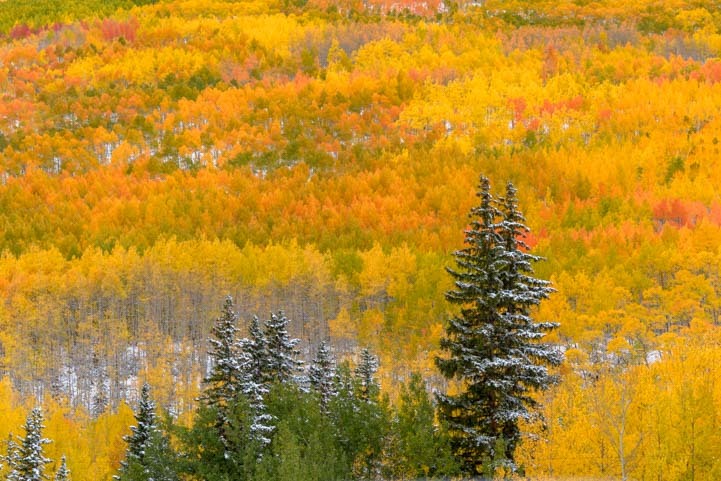 The hillsides were blanketed in color everywhere we turned. 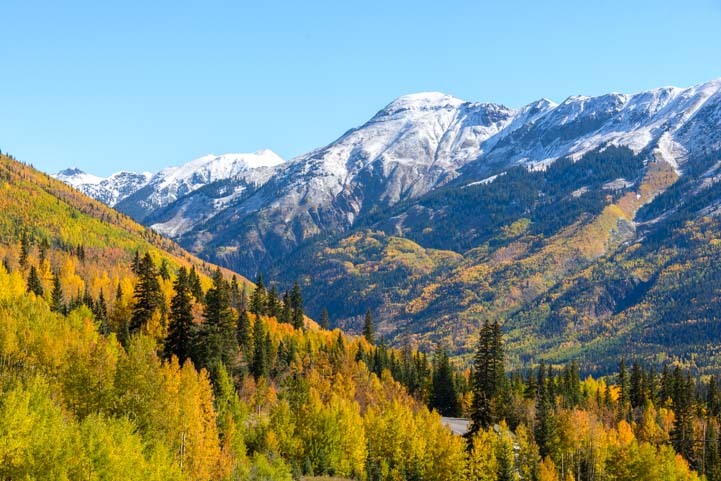 The San Juan Mountains are part of the Colorado Mining Belt that was mined intensively for silver and gold in the late 1800’s and early 1900’s. 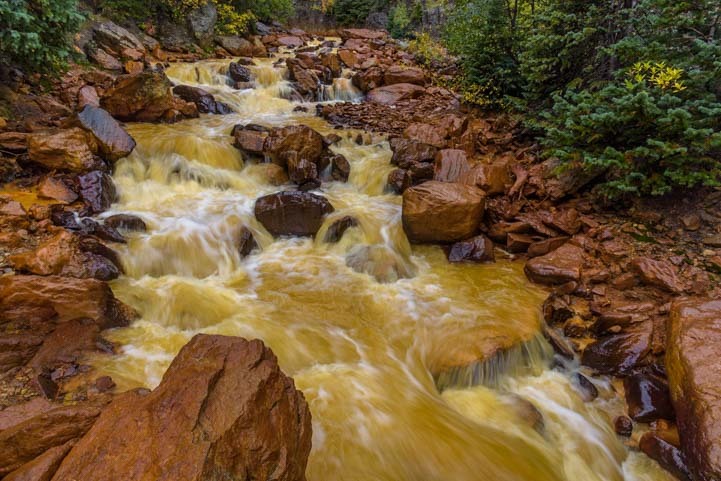 The rivers in the area run orange from minerals leaching out of the tailings piles left behind by the mines. The river water runs orange here. 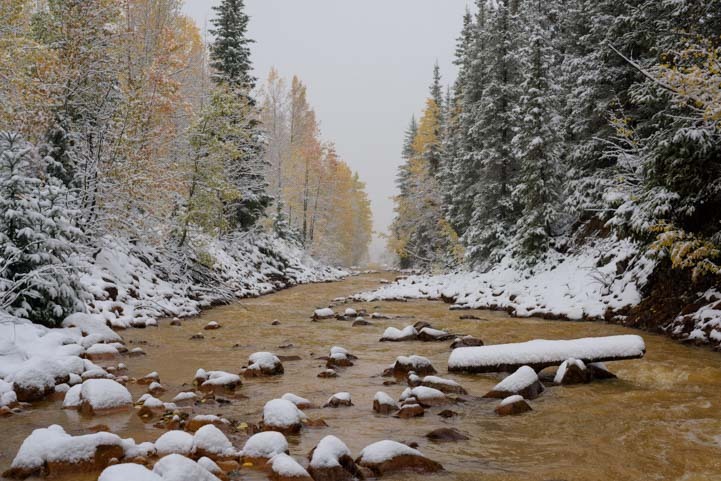 After the snowfall, the reddish water was filled with snow covered rocks and surrounded by evergreens clad in white. Pretty! Eventually the clouds began to dissipate and patches of blue sky began to appear. 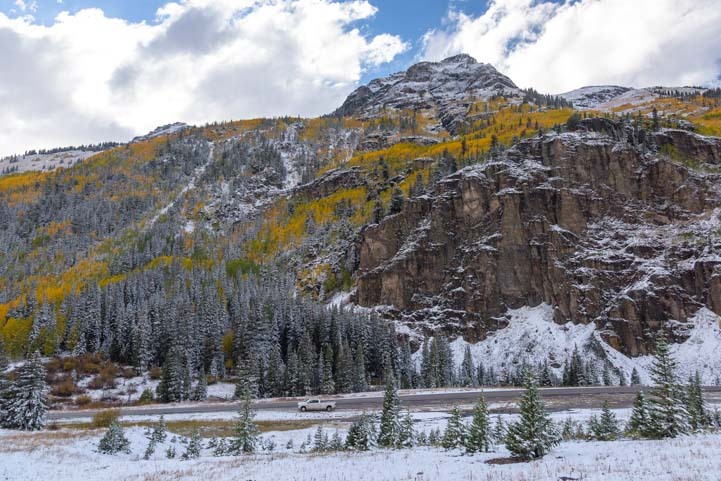 Our truck is dwarfed by this incredible mountain. Yay for some blue sky appearing! 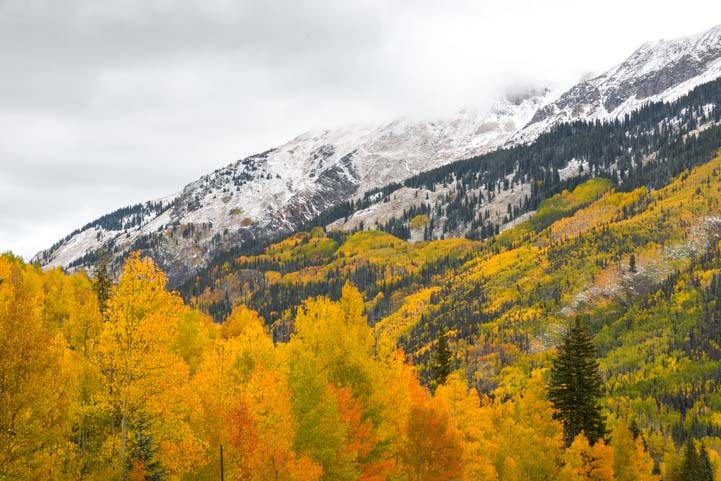 Autumn is gorgeous in many parts of the country, but fall in the Rocky Mountains in Colorado is utterly breathtaking. 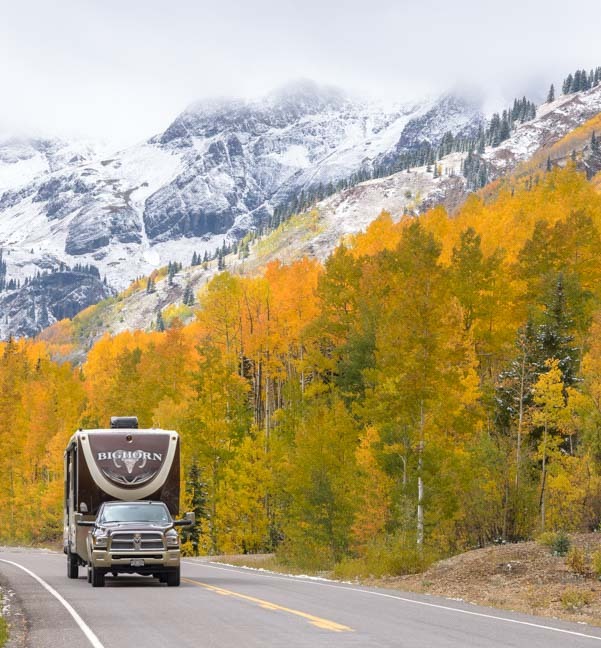 The cool thing for RVers is that you can catch the fall colors in Colorado in late September and, if you’re willing to hustle, you can get to other beautiful areas in far distant states to catch their fall foliage show a week or two later in early to mid-October. We haven’t done that yet, perhaps sometime in the future. 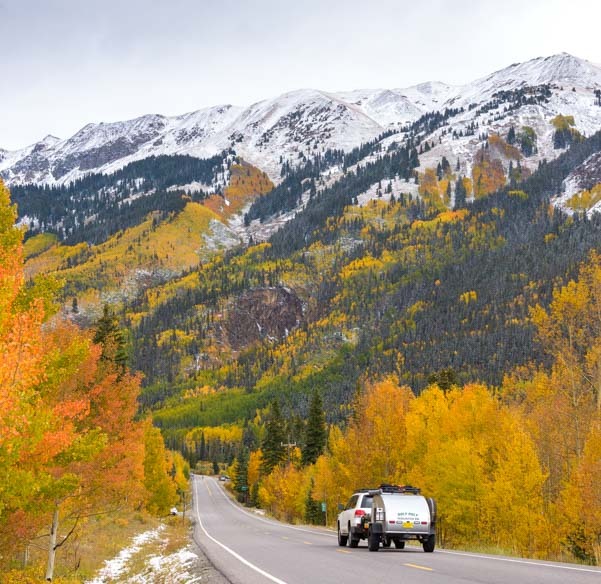 For this year, we savored the colors in Colorado, and were amazed that the mountains seemed to change shades right before our eyes. 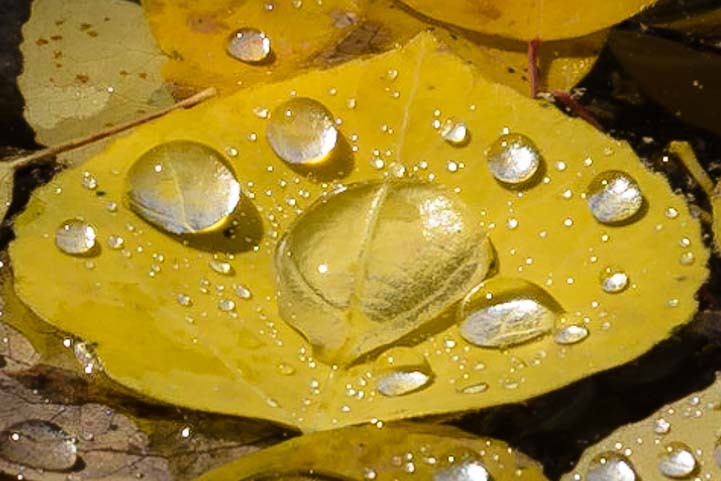 And all the leaves on the ground were covered with tiny water droplets. 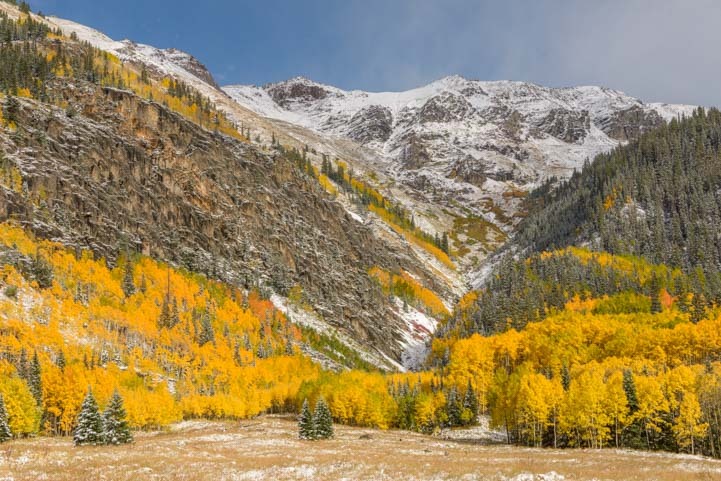 By the time we left this part of Colorado, our eyes were tired from staring so hard and taking so many photos!! But what a wonderful kind of fatigue it was. 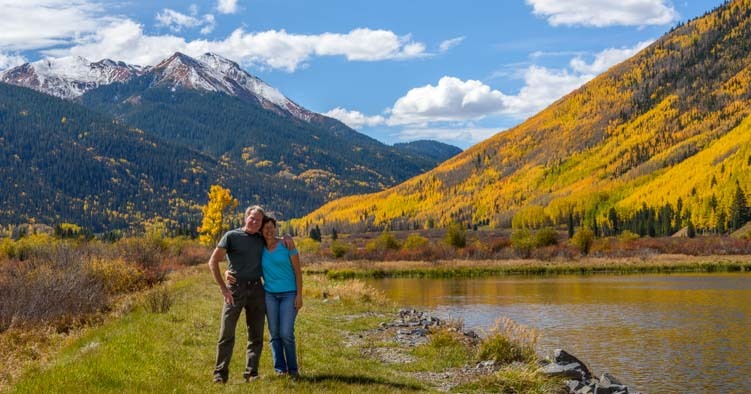 If you haven’t experienced a fall foliage season in the aspen filled Rocky Mountains of Colorado, it is something that deserves some special planning! Happy campers surrounded by astonishing scenery. How wonderful!! During the holiday shopping season, we would LOVE for you to visit Amazon via any of our links. What happens is anything you put in your shopping cart immediately afterwards results in a small commission to us at no cost to you, no matter what it is and no matter when you complete the purchase. This is a huge pat on the back for us, and the small trickle of referral fees from appreciative readers makes it justifiable and possible for us to put the time into this website that we do. Thank you!! 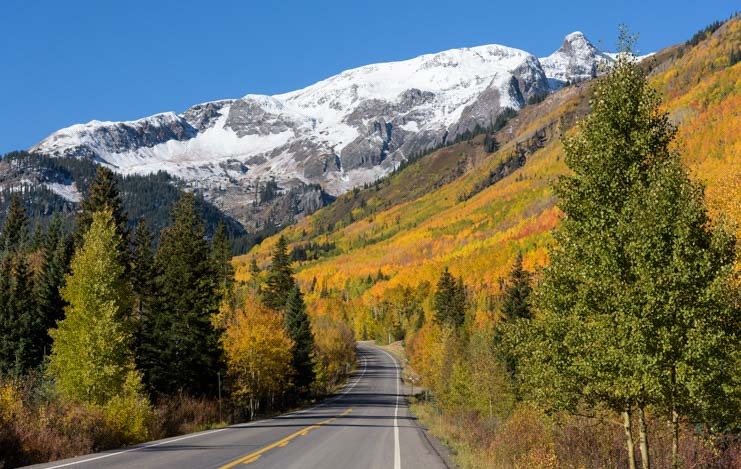 This entry was posted in Colorado and tagged Colorado, Colorado Fall Foliage, Fall Foliage, New, Snow, Travel, USA, WP Travel by Roads Less Traveled. Bookmark the permalink. Great pictures! How do you set up the ones of your rig and/or truck from far away or while it’s driving along a road? We always do a lot of hiking around our rig, so faraway shots are easy to get. If we’re in the process of parking, I am often outside somewhere helping Mark, so that’s how we get those. I learned long ago to have my camera around my neck at all times!! Great photos, Emily! 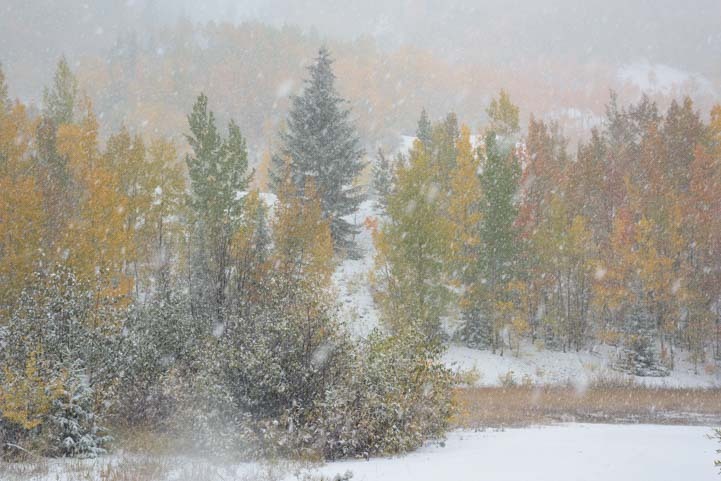 I’ve ridden that highway several times during the Bicycle Tour of Colorado, but it never looked like that in late June. 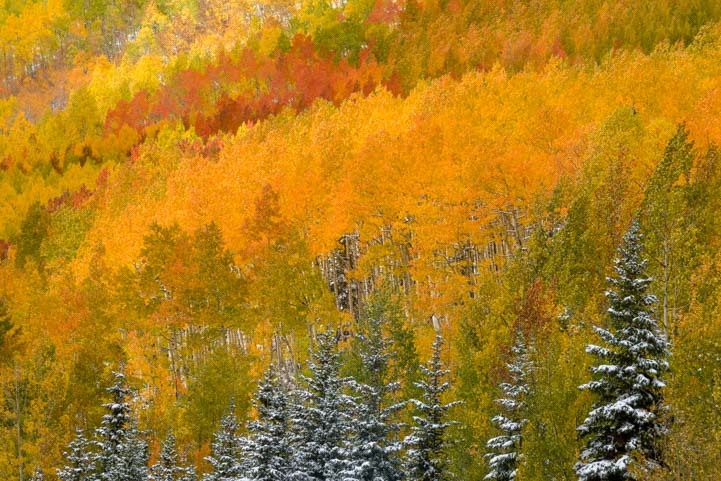 My wife and I will have to take in the Colorado fall foliage sometime in the near future. We did it on the Bike Tour of Colorado too back in ’02 or ’03. There was torrential rain the day we rode from Durango to Ouray. Some of us got picked up by a bus as a mudslide was barreling down the mountain. The bus had to swerve wildly to miss getting hit as the mudslide crossed the road. It was quite a thrilling adventure! Unbelievable, David!!!! We’re living parallel lives!! We were at the front of the pack and when it started raining we started shivering uncontrollably on the big descent, so we stopped and tred to flag down a ride in the pouring rain, but all the drivers zoomed past, waving a big friendly hello back at us, unaware we needed help!! Luckily, we got picked up by the bus, as all we had on were shorts!! Dozens of frozen cyclists and their bikes got on that school bus, lol. The driver wasn’t sure she could make it around the mudslide, but everyone started yelling, “Go, go, go! !” I thought we’d end up as a headline in the news, for sure!! When we got to Ouray we set up our tent in driving rain. The funny saving grace to it all for me was I met an old high school friend in the food line that night — hadn’t seen her in 25 years…!!! I can’t believe you hiked through the woods in cycling shoes with your bikes. What a crazy tour that was!!! Yes, it was a crazy, yet memorable day. The rain came to me just after leaving Silverton. 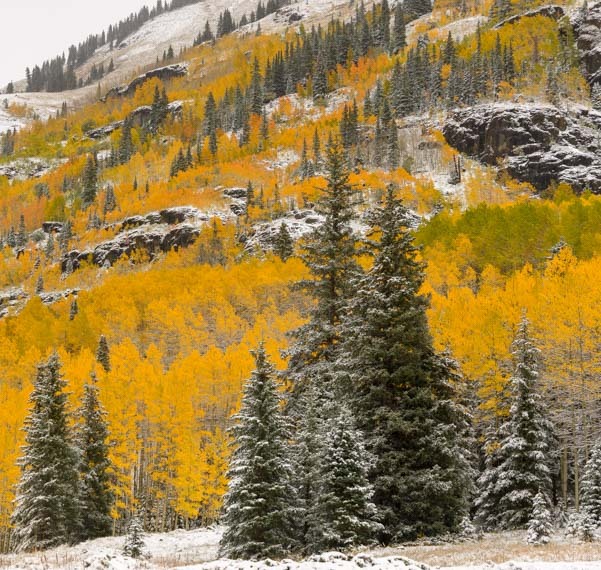 I waited out the heavy rain with others in an old barn, just before the climb of Red Mountain Pass. When it eased, up the hill we went, staying warm from the effort. Then the aforementioned mudslide. Interesting to hear of your exploits on the bus! I’d not heard anything about that. It’s never fun to set up your tent in the rain. It’s even worse when you find out it leaks! Ah, the joys of weeklong bicycle tours! I still can’t believe we were both on the mountain that day. What a wild time! Those bike tours are the best, even when the weather doesn’t cooperate. 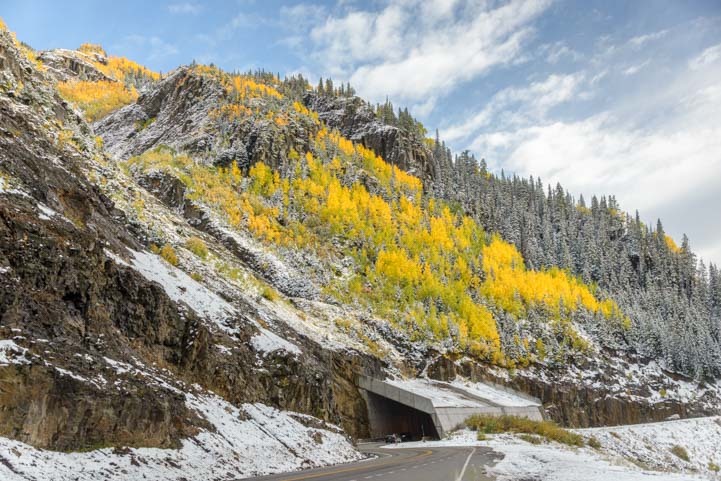 Do you remember Wolf Creek Pass was under construction? I did a swan dive off my bike on the chip-seal pavement and took an ambulance ride to the bottom and got five stitches in my forehead! Mark was ahead of me at the bottom asking everyone that came down, “Did you see a girl in blue?” because he didn’t know I’d crashed, and then I showed up in the ambulance!! 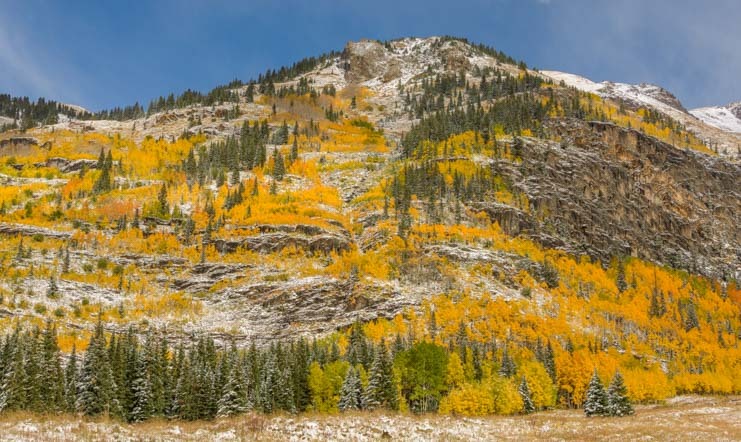 But it was Slumgullion Pass that really took the cake for us. I didn’t think that climb would ever end, lol! What a great and memorable week of cycling!! Enjoy your Thanksgiving, David, and thanks for the trip down memory lane. Brrrrrrr! We are one of your full time readers, M & M, and continue to enjoy your pics and wonderful articles! 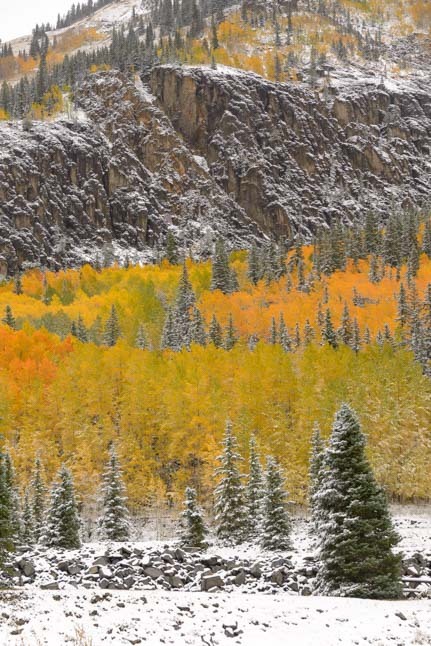 Some cold weather adventures are better seen through your eyes; rather than ours, though. 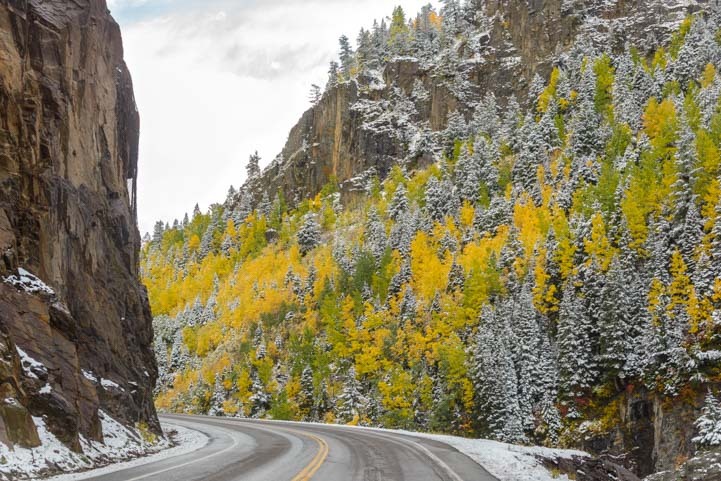 Thankfully, you confirmed our wise decision to avoid Colorado in October, and instead, enjoyed our stay at the Verde Valley here in Arizona. And then went on to the Colorado River, for a few days. Then back to our Sun City home, until after the Holidays. Then on to new adventures, probably around Yuma, for awhile. Will save Colorado, and the Northwest for our Spring, Summer, and Fall travels next year. Enjoy your Thanksgiving here in the Valley of the Sun! And keep those wonderful articles coming, too. Best to you both! Thank you so much, Glen & Bette. I’m glad to hear you’ve been cozy warm in your travels this year and have saved Colorado and the northwest for next. You will have a blast there!! Have a wonderful Thanksgiving. You can make even a snowfall feel warm and friendly! Beautiful photos and warm words to match! Thanks!! 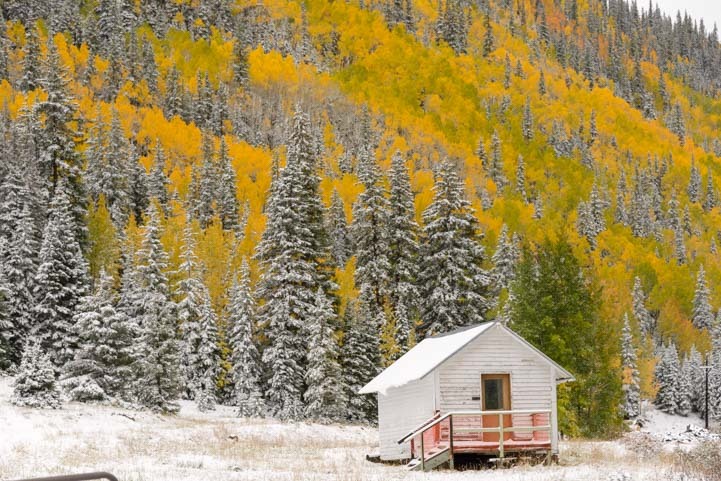 With Nature’s glorious golden hues as a backdrop, it’s easy to make these snowy scenes look warm and inviting!! Awesome, awesome, awesome. We’ve been there in the Fall and we’ve been there when there was snow everywhere, but we’ve never been there for this combination. It’s gorgeous! Thanks for the post! We got really lucky, Janet. 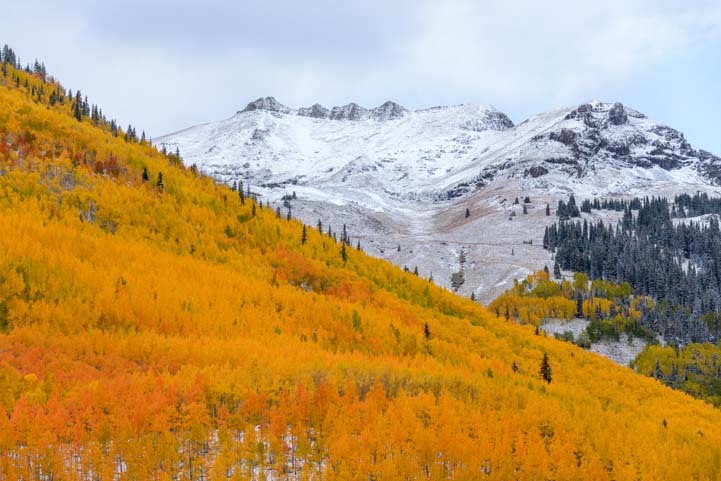 We saw snow during the peak of fall color once before (here), and couldn’t believe we got so lucky twice!! Killer fall shots you Two! Hope to see there in the near Future! Thanks, Tom. It was great to see you! !